A breakthrough in nylon string technology. Martin’s premium classical strings are tonally superior to nylon and the proprietary synthetic material emulates gut strings that have been around for centuries. Magnifico strings, developed exclusively with Aquila, offer precise intonation and exceptional tuning stability. 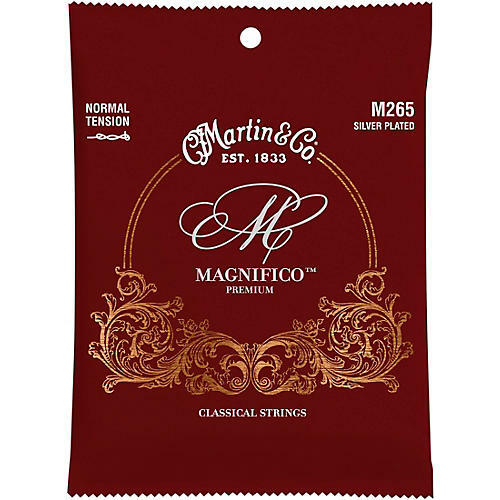 Unlike Martin’s standard classical strings, which have a ball-end, Magnifico classical strings will be offered only with the traditional tie-end. The premium line will debut with two models: Hard Tension (M165) and Normal Tension (M265). C.F. Martin & Co. has been inspiring musician’s worldwide for 185 years and remain one of the world’s leaders in acoustic and acoustic-electric guitars. Their instruments are hand-made by skilled craftsmen and women who use a combination of new design techniques, along with those introduced by the company founder. Known around the world as the guitars by which all others are measured, Martin continues to innovate, introducing features that have become industry standards, including X-bracing, the 14-fret guitar and the “Dreadnought” size guitar. The company is also known for producing high-quality guitar strings and have been making their own strings since 1970. Martin guitars, ukuleles, and strings are the choice for musicians around the world. Get exceptional tone and stability.